After the big wreck the last night at Mobile we basically rebuilt the car on the right side and it took Mike Walker 2 days to get the frame straight. So we took a brand new car along with our new primary sponsor, Alltel, and associate sponsor, Lou's Jewelry, to Pensacola. 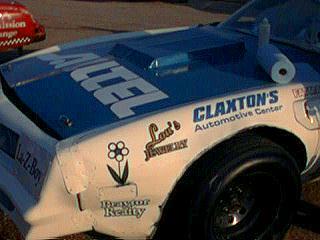 The new car was really bad, all of our old set up notes were thrown out the window and we started from scratch. We made wholesale changes in both practice sessions and then completely changed the car again for the race. I finally drew a decent number, 7th, and we started the race with a lot of unknowns. We shuffled back the first couple of laps while I tried to figure out what it was going to do and sure enough we had pretty good race car. 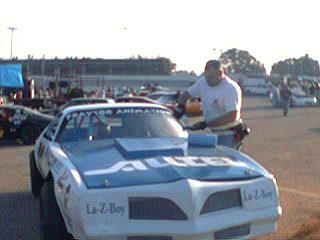 We started to pass cars and work our way back towards the front when I got tangled up in a huge wreck in 1 & 2. 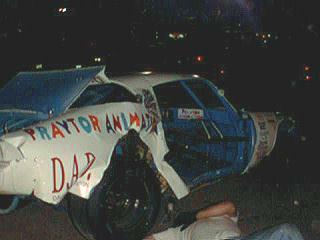 When I went into the turn there were already several cars stacked up, I tried to get by and my car got sideways, I hit the stack spun then somebody hit me then somebody hit me again and I ended up on the apron then somebody hit me again. 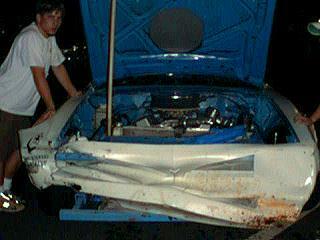 I knocked the rear end out of the car and we were done for the night. A real disappointment considering all the hard work the guys had put into the car. The race ended up taking over 2 hours to complete and the Mobile guys had a great run with Bubba Orso leading wire to wire until he ran out of gas and Hamric in a new paint scheme winning. We'll be working on the car and getting ready for the Snowball in December. 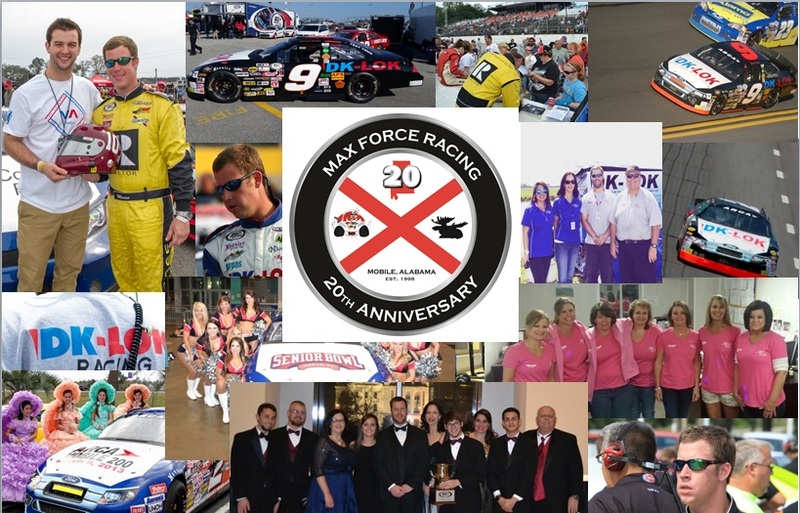 We took a few pictures in Pensacola and a lot in Talledega, look under Winston Cop Sponsorship for those pics. Bull puts the finshing touches on the Alltel/Praytor Animation Pontiac before we roll out for practice. without Bulls help we couldn't have raced at all. Our car with our new sponsor's stickers ready to roll out. Post race, I'm starting to think my wife has the right idea, we should put the car together with velcro instead of pop rivets. 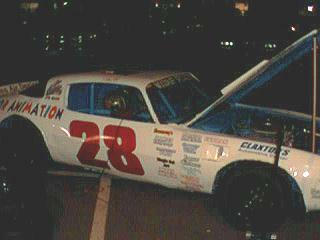 Its becoming a regular theme, last night at Mobile=a very screwed up race car. We had a great car and we set another qualifying time record. We moved up through the field nicely dodged 3 big wrecks and got caught in the last one. It just basically took the right hand side of the car off. Unfortunately for us we had to have it ready for an open house with Alltel the next Saturday. We got it pieced back together and had great show with the Alltel folks at their new store. We're still working on getting it race ready for Pensacola.